They say variety is the spice of life, and anyone who has kept chameleons for long typically ends up culturing some of their own feeder items. When trying to feed small animals or difficult feeders, it can be difficult to find appropriate feeders in any variety. 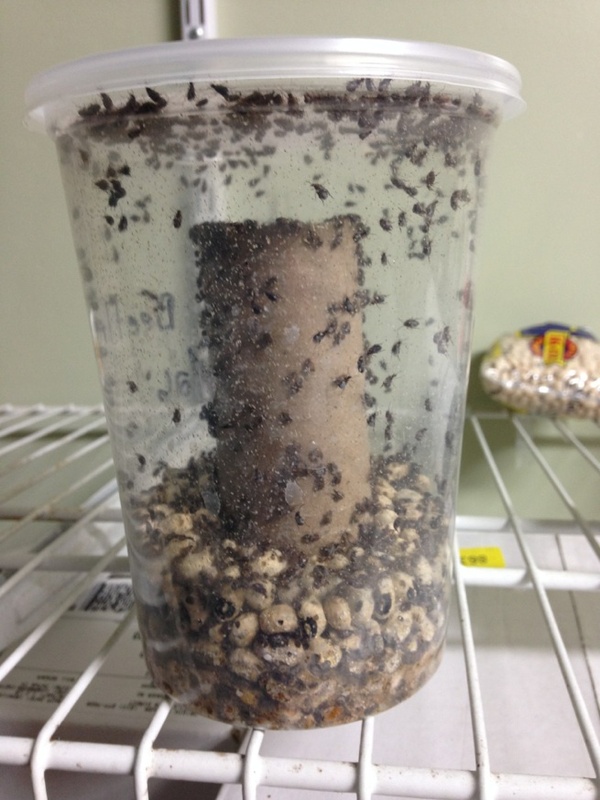 Here, Carl provides us with information on culturing three types of smaller feeders: green banana cockroaches, bean beetles, and aphids. Each of these feeders are great alternative food sources, with the green banana roaches being great for difficult feeders, and the bean beetles and aphids being excellent for small chameleon species and neonates. Green feeder insects are hard to come by so having one that’s easy to care for and reproduce makes this insect the perfect candidate. Panchlora nivea is a smaller (1/2”-3/4”) species of roach that can be found in the southern United States and Caribbean Islands. With it being a species that can fly, they can be found around porch lights on warm humid summer nights. Captive care requirements of this species are easily met. The only real challenge with this species of roach is containment. As adults they are able to climb glass, plastic, and they can fly. 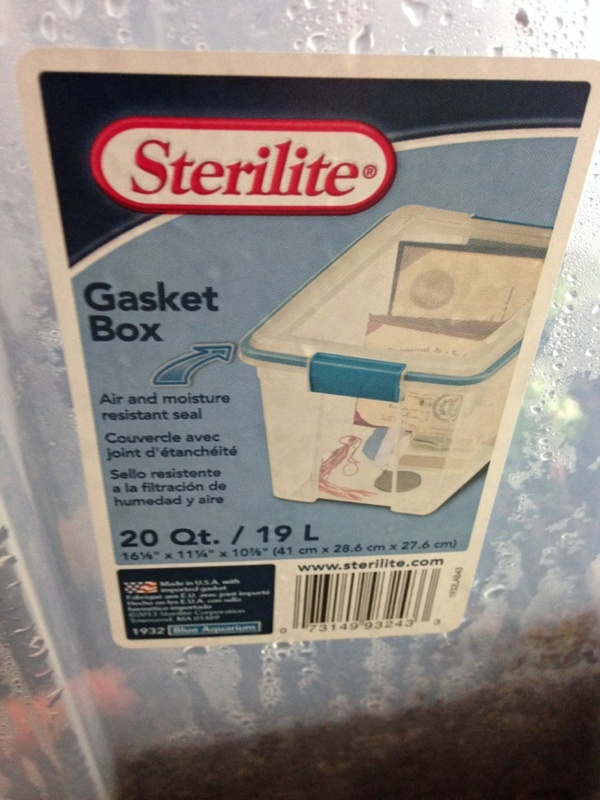 I raise my colony in Sterilite tubs that have a gasket around the lid. A small strip is cut from the lid and replaced with aluminum window screen that is glued or siliconed in place. The base is a 50/50 mix of organic potting soil and coco fiber. I also mix in some crushed dried oak leaves and pieces of soft oak wood. Beech leaves work well also. On top of the mix I’ll add more leaves, broken up pieces of wood, and a cork bark flat. This species likes it humid and moist (not wet) so the container is misted when needed. 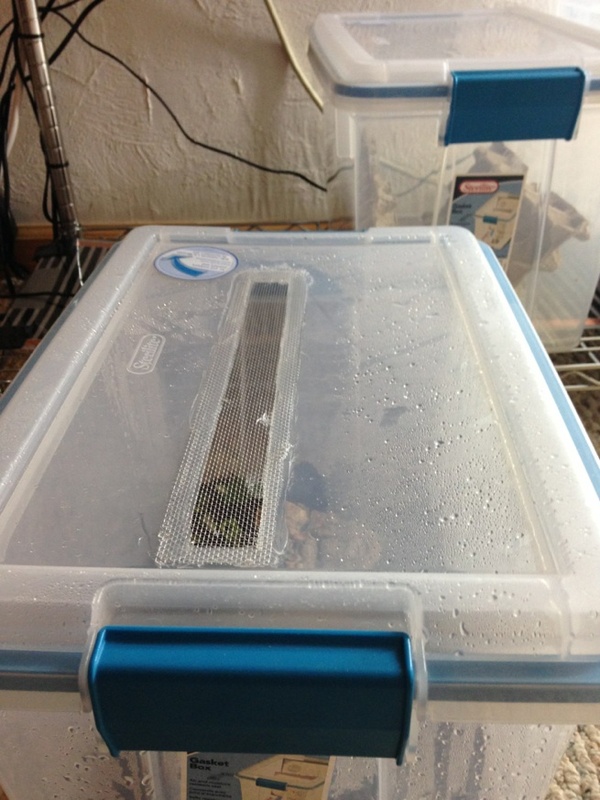 I keep the containers on heat tape that keeps the substrate temperature between 80-85ºF. Any warm place works. Breeding activity slows down if the temperature gets below the mid 70’s Fahrenheit. Food isn’t much of an issue with this species. I provide them with banana peels, apple slices, carrots, mango, and leafy greens. Remember to wash all food items well before offering. I will also sprinkle some dry gut load on the surface occasionally. Remove any food items that start to show signs of mold. Start your culture with the largest amount of mixed sized nymphs and adults you can. Give the culture a 2-3 month period to adjust and start producing before removing any adults. It just doesn’t get any easier when it comes to keeping bean beetles. 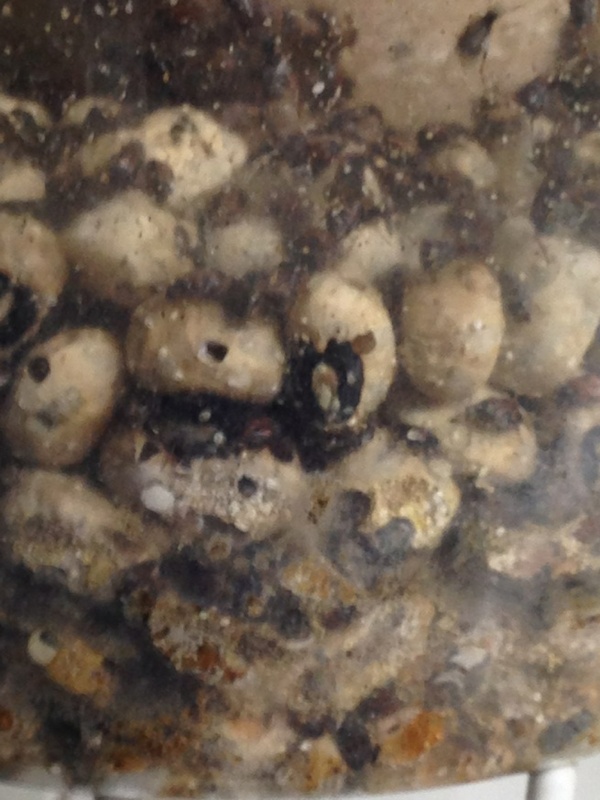 These little beetles, weevils actually, are a great food for small and baby chameleons. There are a few different species in culture but all can be kept under similar conditions. Deli cups (32 oz.) 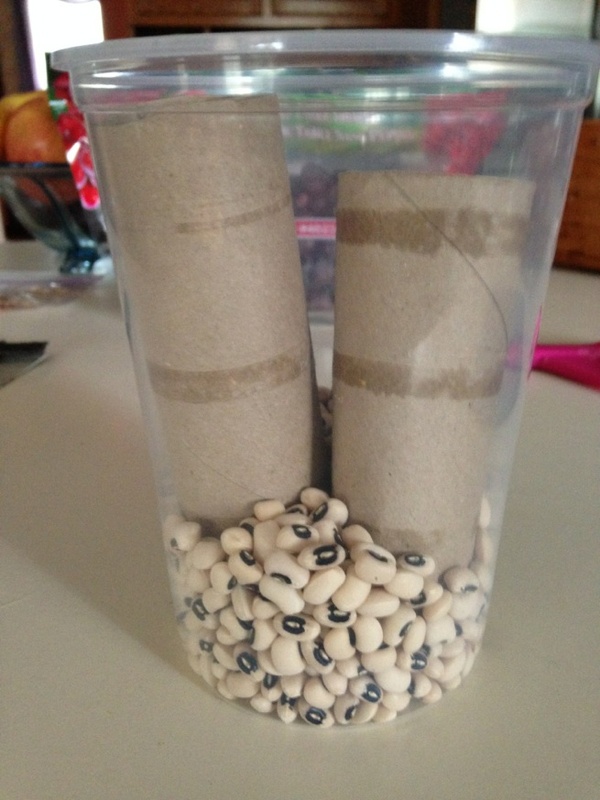 with ventilated lids, black eye peas and toilet paper or paper towel inner rolls are all that is needed for culture. 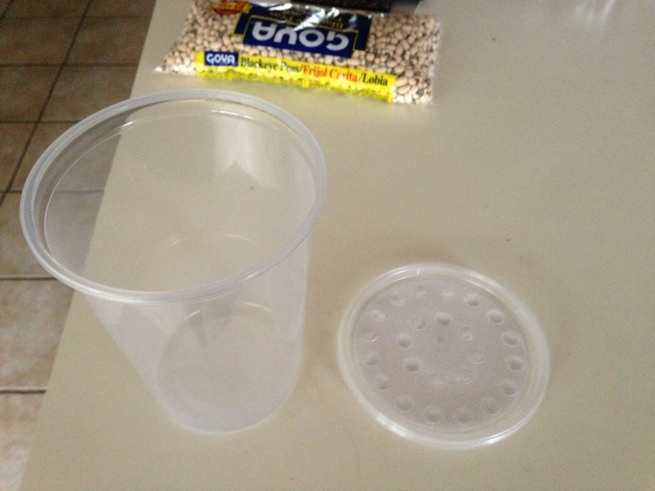 Pour a few inches of the peas in the deli cup and push the cardboard tube into the center of the peas. 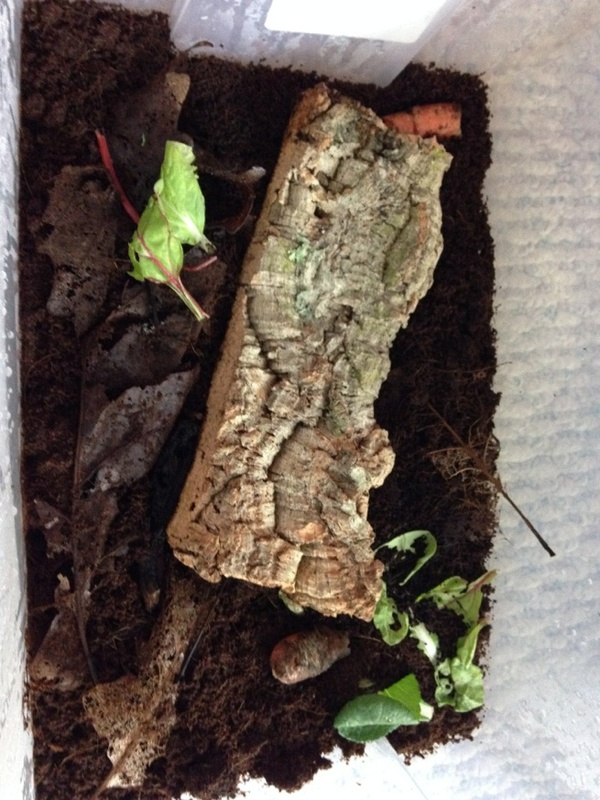 Now add a healthy amount of beetles from an established culture. Put the lid on and you are done. Keep the culture between 70ºF-80ºF and in an area that gets light. On top of cages works great. No food or water needs to be added as the peas provide the larva with all the food they need. Once you start seeing little white dots on the outside of the peas you’ll know the beetles are laying eggs. 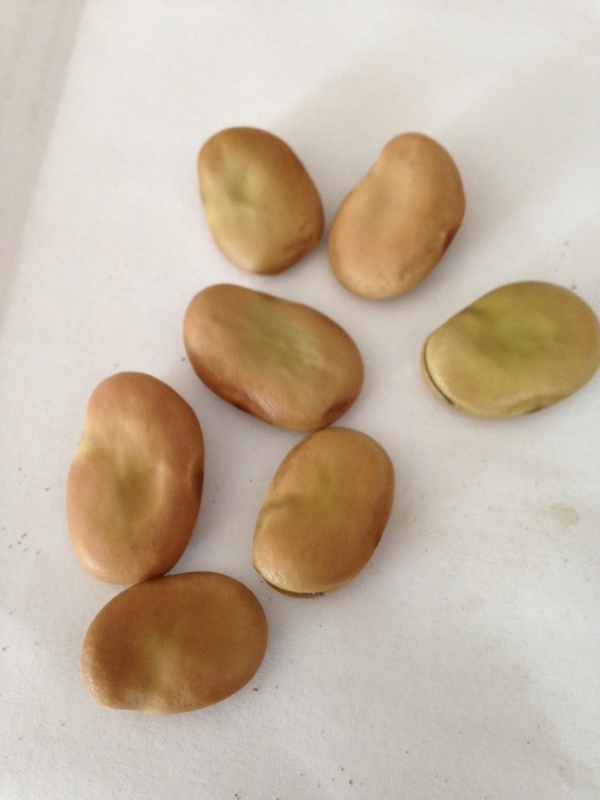 The larvae live inside the peas and over time you will need to add more peas as the larva consume them. The pea aphid, Acyrthosiphon pisum, is a green aphid that uses peas, beans, alfalfa, and clover as its host plant. These aphids reach a size of around 1/8”. Because of the small size and attractive green color this can be a wonderful small food item for Brookesia, Rhampholeon, Rieppeleon and babies of the larger species. The supplies you will need for culture are deli cups (32 oz) or seed starting trays, peat pods, a good supply of pea or bean seeds and a starter culture of aphids. 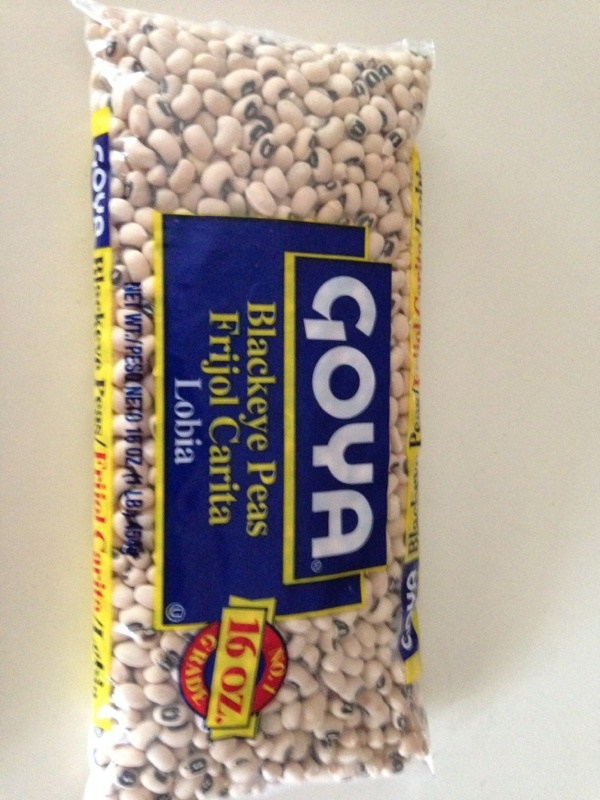 I prefer to use fava beans because the stem is much thicker. This gives the aphids a larger area to feed. Start off by letting your seeds soak overnight or until they start to swell. 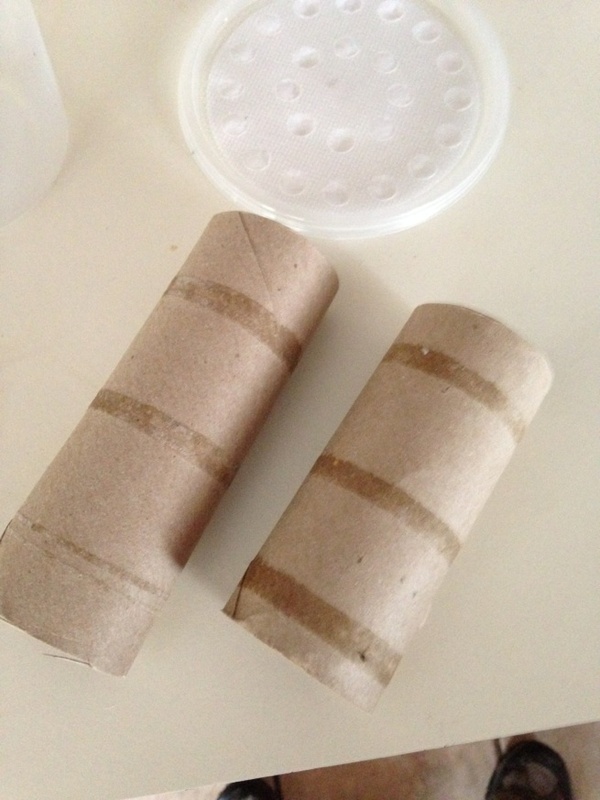 Soak the peat pods in water until they take shape. Once the seeds start to swell it is time to transfer them to the peat pods. Put 2 or 3 seeds just below the surface of the peat. 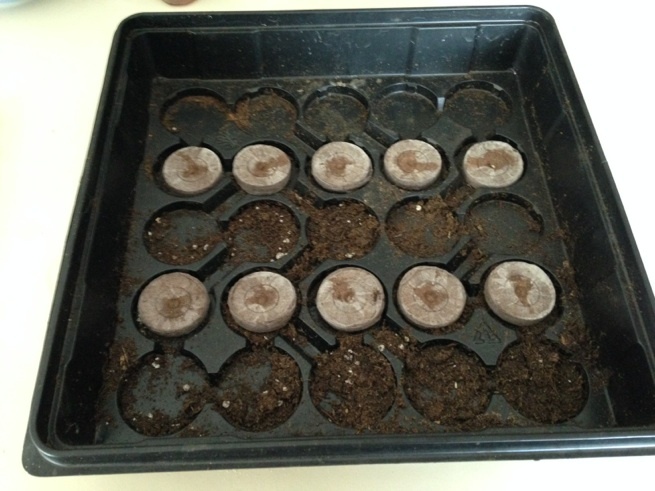 Place the seeded peat pots in a deli cup or on the seed tray. 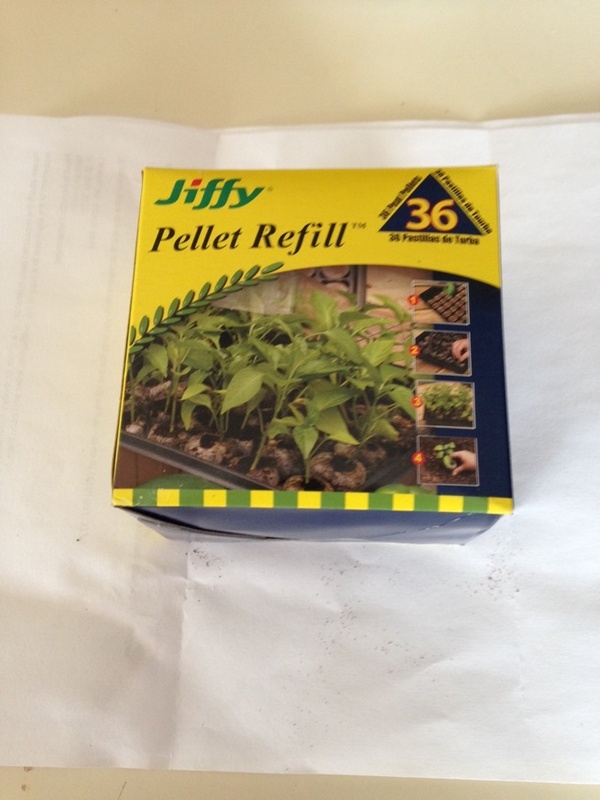 Place the deli cup or seed tray under a strip light or on a windowsill so the seeds can sprout. 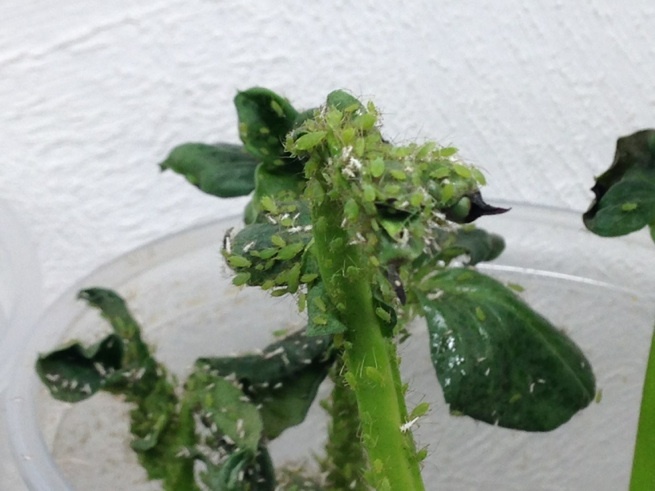 Now is when you want to order your starter culture of aphids. By the time you receive your starter culture the seeds you started should be sprouted. 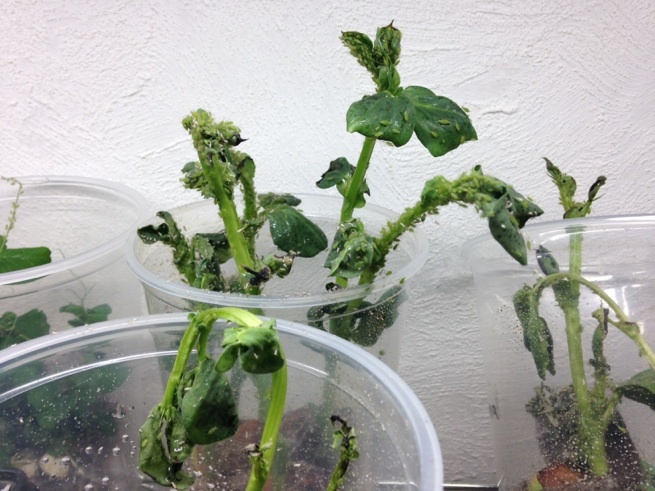 Transfer the aphids from the starter culture to your sprouts by cutting the stems from the starter culture and placing them among your sprouts. 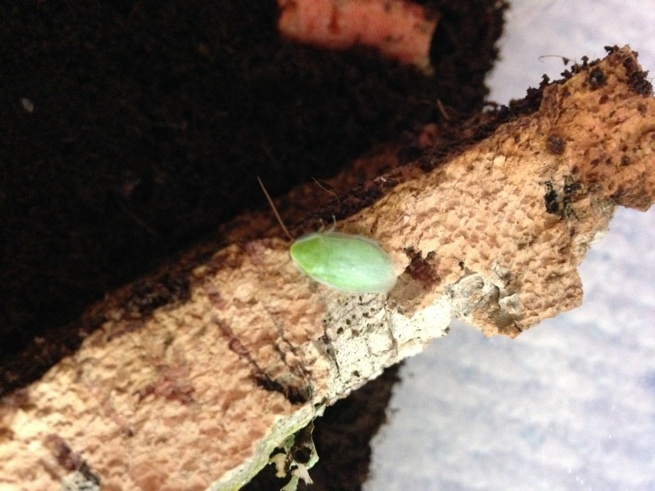 Each mature aphid will produce between 6-10 nymphs daily and as many as 100 in her lifetime. Nymphs become adults after 4 sheds in 10-14 days. To keep the culture active fresh sprouts will need to be available about every two weeks. 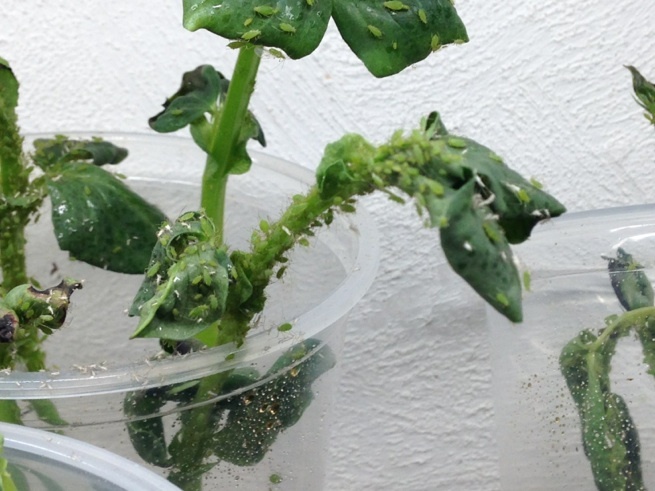 The length of time your culture lasts will depend on how many aphids you have and the type of food plant you use. 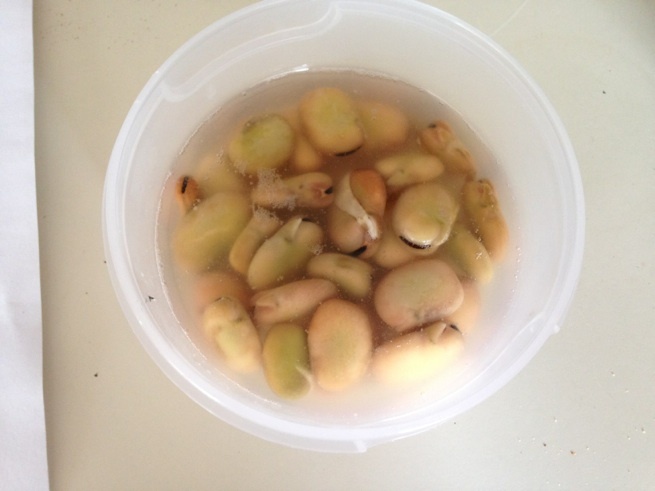 I get 2-3 weeks per culture using fava beans. To feed your animals you can either cut the stem of the sprout and put it in the cage among the plants or you can just tap the aphids off the sprouts into the plants.